Song begins with 2 or 3 high thin notes, followed by single warbled note and a low trill. Description: Sexes similar. Buffy head and nape with fine black streaks on nape and sides of crown; unstreaked buffy central crown stripe. 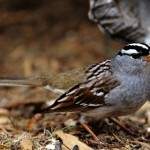 Brown upperparts with streaked back; whitish unstreaked belly. 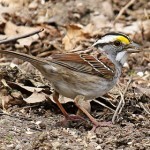 Whitish throat bordered with dark stripe on each side; buffy breast band with widely spaced dark streaking on breast and sides. Tail feathers edged with buff; corners of tail light gray. 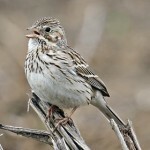 Juvenile has paler head; streaked central crown stripe; and more extensively streaked underparts. 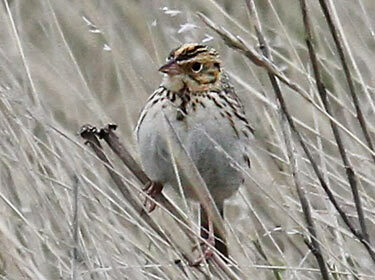 Behavior: Secretive and hard to spot; slips through grass instead of flies when flushed. Habitat: Prairies, other natural grasslands, and weedy fields. Where in Nebraska: Uncommon spring and fall migrant across most of the state, becoming less common eastwardly and rare in extreme eastern counties. Status: Numbers have declined with loss of virgin prairie habitat.